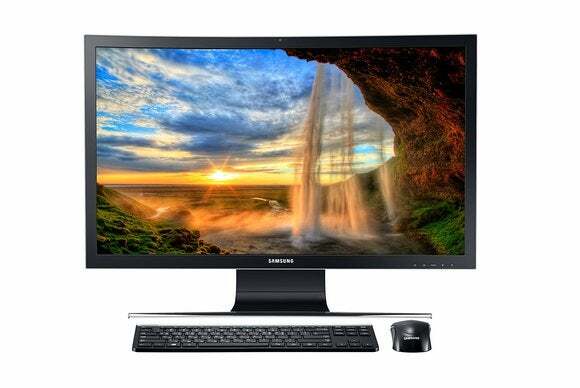 Samsung is trying to smash the status quo in PCs with a new all-in-one desktop computer that has a curved screen. The idea for the Ativ One 7 Curved came partly from Samsung’s TVs, which already have curved displays. Samsung has already been offering laptops and Chromebooks, and the 27-inch all-in-one will be its first desktop computer. The all-in-one looks like a 27-inch curved TV, with all the PC components at the back of the monitor. As with TVs, the curved display could provide a more immersive gaming and entertainment experience than conventional monitors, said David Ng, product manager at Samsung. But Ng acknowledged that the PC’s unusual shape could catch potential buyers off guard. He said the screen’s curved contours will grow on desktop users, Ng said. “When you get used to it and you spend time with it, you appreciate it even more,” Ng said. The desktop can also be used as a TV. Game consoles and cable boxes can be hooked up via an HDMI port. It is priced at $1,299 and will become available in February. Samsung couldn’t immediately name the countries in which the PC will become available. The Ativ One 7 Curved is a good example of Samsung’s engineering chops, but the product has some flaws. It does not have a touchscreen, which is common in all-in-one desktops from Lenovo, Hewlett-Packard, Dell, Asus, Acer and other PC makers. Samsung’s PC division doesn’t yet have touch technology for curved screens, Ng said. Creating the all-in-one was a challenge, as the electronics needed to be behind the curved display. All-in-one PCs have processor, memory, storage and other components behind the display. Samsung installed a slightly curved motherboard at the back of the display. Samsung’s PC division worked with the TV business unit to make the all-in-one, Ng said. The Ativ One 7 Curved has an upcoming Core i5 processor, 8GB of RAM and 1TB of storage. It has USB 3.0 and HDMI ports, but it lacks other connections such as DisplayPort, which is used by businesses. The all-in-one was announced ahead of International CES, where Samsung also plans to show thinner and lighter Ativ Book laptops with new chips from Intel. The Ativ Book 9 is Samsung’s lightest Windows laptop at 0.93 kilograms, and the chassis is less than 12.7 millimeters thick. The 12.2-inch screen can display images at a 2560 x 1600-pixel resolution, and the laptop’s Core M low-power chip delivers performance equivalent to a Core i5 chip based on the older Haswell microarchitecture, Ng said. The Core M chip is typically used in tablets. The Ativ Book 9 with 128GB of solid-state drive storage and 4GB of RAM is priced at $1,199, and a model with 256GB of storage and 8GB of RAM is priced at $1,399. Also updated was the Ativ Book 9 Plus, which has a 13.3-inch touch screen and weighs 1.4 kilograms. The laptop has a new Intel Core processor, and the display shows images at a resolution of 3200 x 1800 pixels. A Book 9 Plus with a Core i5 chip, 128GB of solid-state storage and 4GB of RAM is priced at $1,299. A model with Core i7, 256GB of storage and 8GB of RAM is priced at $1,699. The new laptops can also link up wirelessly with Galaxy mobile devices to receive phone calls and share files. The laptops will ship in the first quarter this year, Samsung said.